Life starts to settle down and routines start to form. I have time to venture further and I am intrigued to discover what changes have happened since I have been away, for sure, Delhi is still the same old crazy place, but it would appear that it is attempting a new level of sophistication – read that as you will. The middle classes are attempting to deny all that is Indian, the Hindi language is dying in their homes, designer western clothing is replacing kurta’s and sari’s, and though it has been happening for a long time, the now classic and oft forgotten, except from those talking with a nostalgic air, Ambassador has been replaced with swankier imports, Mercedes and BMW’s to name but a few. Drivers earning less than £100.00 per month are driving cars whose imported worth is 1000 times their monthly salary. I often wonder what their thoughts must be. Vasant Vihar, where I am staying, is one of the up-market, expat areas of Delhi (you can tell, even the security guards have a/c!) but whose shopping centre has, if anything, degenerated over the last three years, due to the emergence of the dreaded shopping mall, it makes my home town of Wakefield look like Knightsbridge in comparison, and that is no mean feat! The pedestrian area is an uncared for shambles, though rather charmingly, each of the few remaining trees have small well-tended Hindu temples at their base. Cows wonder past coffee shops and designer clothes stores in search of sustenance, though as most I see are chewing on cardboard, there is little to be had. Given that the temples are well cared for, these most holy of animals seem to be left to fend for themselves. Ferengi’s (foreigners) march around trying to look like they belong and Indian ladies in smart, designer gear come out of the ‘international’ supermarkets, tripping over cracked and in places, smashed paving, trailed by boys laden down with bags of imported products such as Ryvetas, Lindt chocolates, fish fingers and smoked salmon, chorizo and dairy milk. These supermarkets being located in a notorious expat enclave, stock imported foods at vastly inflated prices. Le Marche, an old haunt of mine is still here but I thought I would try the newly opened (to me at least) and fresher sounding ‘Natures Basket’. I delight in discovering one improvement in that that the variety of wines now available is no longer restricted to Indian brands, some of which can be quite palatable, but to have choice is a great improvement. Yet I am old school, yes to know you can get marmite (£7.00 a jar) and kettle chips (£5.00 per bag!) if required is a comfort but sauntering around the store, I saw staff wearing ridiculous net head wear in an attempt to look hygienic, futile at best. Then I found products ranging from Champagne (yes, French proper Champagne) to colon cleanser (I kid you not), but could I find a stock cube, chick peas in anything other than a tin (£2.40!) or powdered cinnamon? Not a chance. 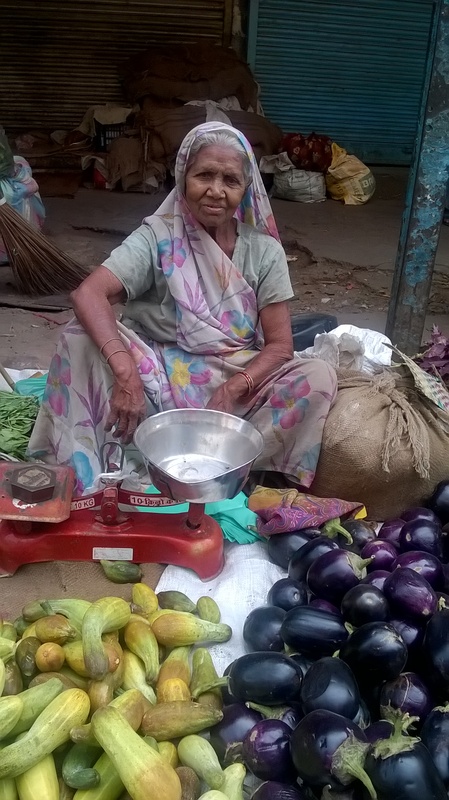 The vegetables were overpriced and over ripe, and so I discover it is still better to purchase from the sabzi walla (veg man) who comes around the colony every morning, shouting his arrival with a melodic lilt and pushing a hand cart laden with beautifully presented, fresh (yes fresh!) produce; potatoes and carrots, cabbage and lokhi. 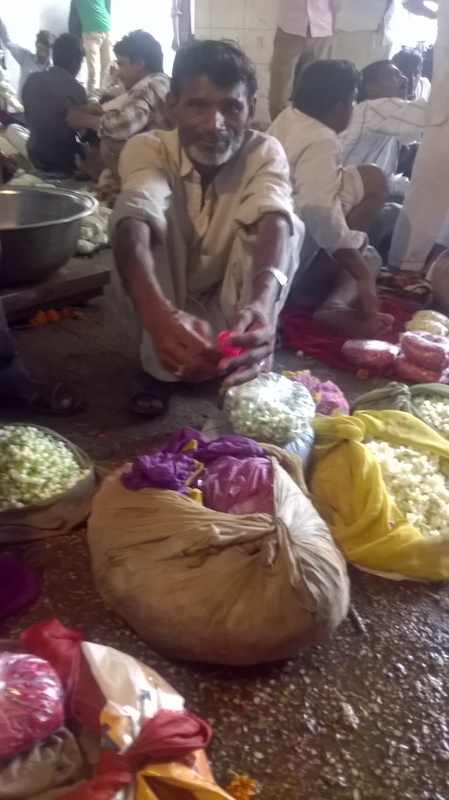 Being out of touch with the latest prices, I am not sure I got the best deal but it was better quality and certainly better priced than in the shop and the look on his face at the appearance of the white Memsahib in her pyjama’s bargaining in Hindi was worth every extra rupee spent. One lump or two? 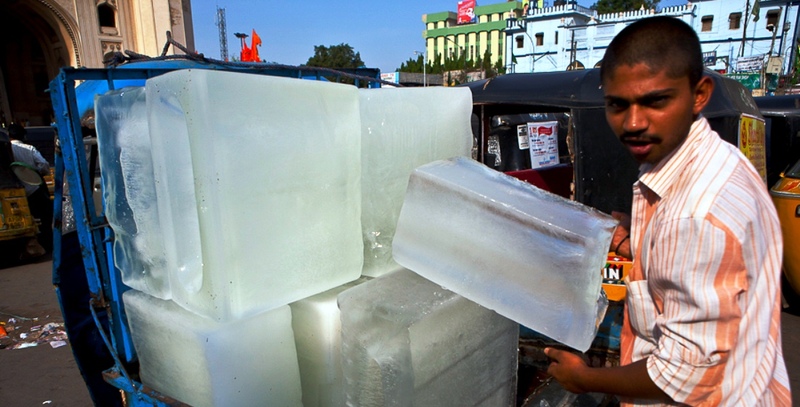 Buying ice India style. 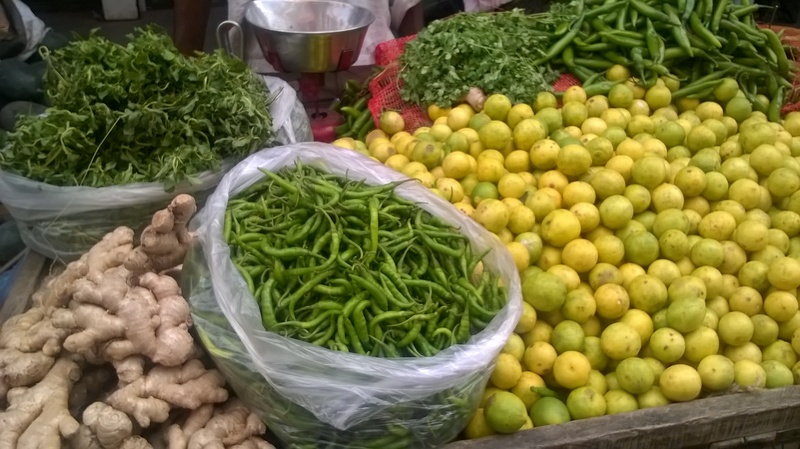 Indian staples, limes, ginger and chillies. 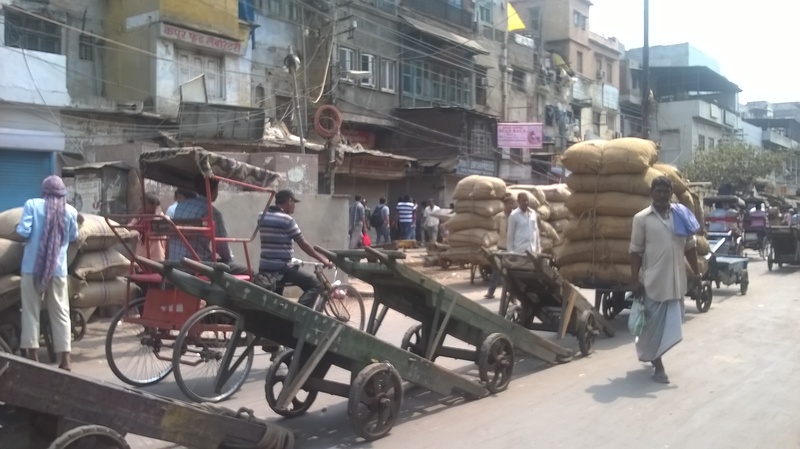 Goods still transported into and out of Old Delhi the traditional way. Interesting piece. Personally I rely on friends who are coming back from abroad to get me my stocks of Marmite and Scotch marmalade and this is not a bad option given the numbers of Indians that are travelling abroad these days for both work and play. And for John West sardines, the best and cheapest place to buy is still the good old INA market ! As I sit here on my white canvas couch in the beautiful clear blue skies of Atlanta Georgia, your post takes me back to Delhi just as I remember it. I long for India and miss it so!! Thanks for the memories. There is not a day that goes by that I don’t think about it and long to be there. 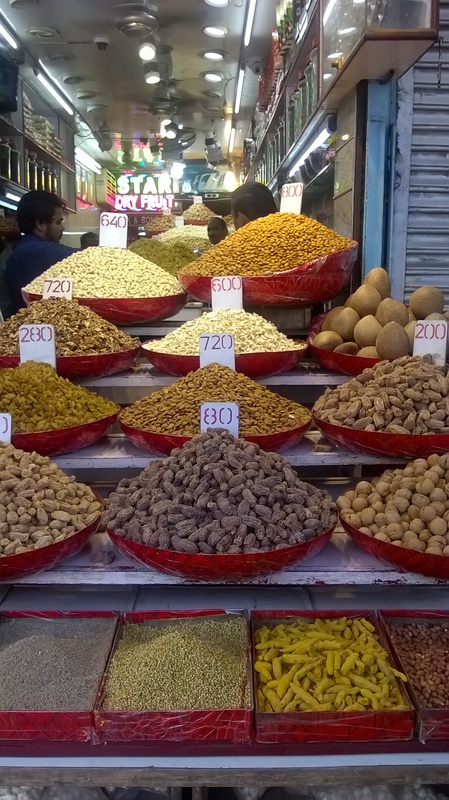 I had the same thoughts as yours when I walked the Basant Lok Market in Vasant Vihar a few days back. I would go there as a child to have ice cream from Nirulas. The entire market seems run down now and there is litter and dirty water all over the place. I hope it improves as it used to be a lovely market to walk around in long time back. Entertaining, as always.The end came abruptly,and was a surprise.Was expecting more.Took me some time to realise that what I thought to be a preamble was actually the body .Philippa couldnt possibly be even half as old fashioned as me,adhering to the school formula, introduction, body, conclusion! Much of present day India is going to disappear in the next five years or so.Memsaheb PK can point that out better than anyone else, as she does here. Ok. I’ve started stalking you.